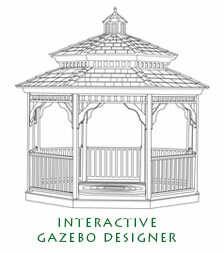 At A&M Barns And Gazebos our barns, cabins, playhouses and gazebos are built the old-fashioned way - with pride. We care about our products and the people who buy them. These quality structures are built to be used and enjoyed. They will be a functional and attractive addition to your property for years to come! We just don't build them any other way. Please call or stop by our shop to find out more; we'd like to meet you! We are a family operated business, we are not merely a factory. There is no middle man. When you call, you will speak directly with one of us. We pay close attention to every structure we build. If you live within 30 miles, we will deliver your fully assembled gazebo, cabin, storage shed, etc. for no extra charge. CUSTOMIZE With the custom options we offer at A&M Barns And Gazebos, we can make your dreams come true! Using the finest materials on the market, our builds result in a product not only esthetically pleasing to the eye, but also structurally solid and resistant to extreme elements. CONVENIENCE Purchase inventory ready for sale to avoid a lengthy wait! Easy to assemble gazebo kits! Local free delivery! CONFIDENCE By purchasing a product from A&M Barns And Gazebos you also eliminate the middle man. We are the manufacturer! Throughout the purchase process our staff is willing to work together with you, advising you on the most attractive design for your setting, helping you choose the right materials, keeping you within your financial goals, and arranging shipping and delivery. Open Monday, Thursday, Friday 10 a.m. to 5 p.m. Tuesday, Wednesday, and Saturday by appointment. Open from 8 a.m. to 5 p.m. Monday thru Friday. Give A&M Barns And Gazebos a call today at (608) 536-3498 or Contact Us for more information. © 2018 A&M Barns And Gazebos. All Rights Reserved.